This article comes to us from Roger Flury, IAML past president and author of Pietro Mascagni: A Bio-Bibliography (Westport, Conn.: Greenwood Press, 2001). Mascagni died 70 years ago this August. Pity the composer who has the misfortune to produce a work whose popularity overshadows the remainder of his or her creative output. 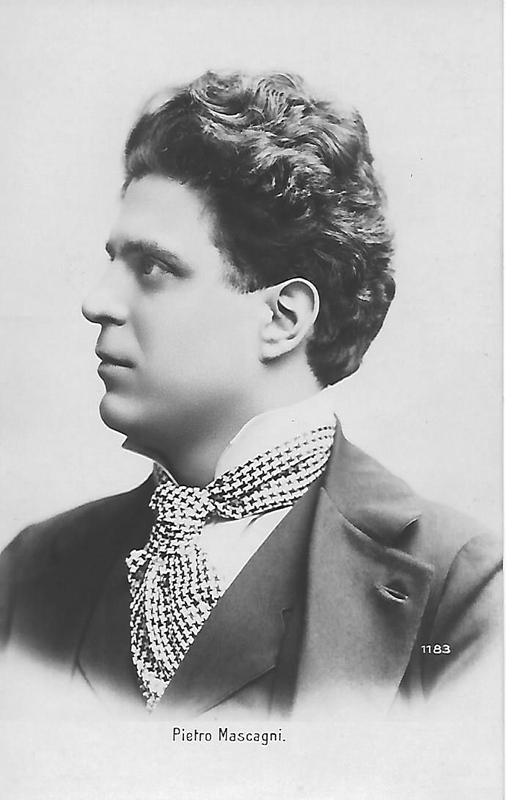 Take young Pietro Mascagni as an example. In an attempt to win some prize money, feed his family and gain the attention of publishers, he put his beloved magnum opus, Guglielmo Ratcliff, on hold in order to throw together an entry for a one-act opera competition. As a result, he not only became famous overnight, but also created the verismo movement in music. Within a few years, he became one of the wealthiest composers in the world. But, as the composer of the ground-breaking Cavalleria rusticana, Mascagni soon discovered that he was expected to produce more operas in the same vein. Queen Victoria, after sitting through excerpts of the gently pastoral L’amico Fritz in a command performance at Windsor Castle, devastated the proud young composer with the words, “Signor Mascagni, when will you give us another Cavalleria?” Try as he might to shed the unwanted image of a red-bloodied verismo composer, posterity – at least until recently – has refused to recognise the true breadth of his creative genius. In the 70 years since his death, there have been some valiant attempts to accord Mascagni the status he so richly deserves. The musicologist Mario Morini was an early tireless advocate, producing the definitive two-volume study on the composer, and the conductor Gianandrea Gavazzeni also promoted the composer wherever possible. But some discomfort at Mascagni’s association with Mussolini and the facist regime ensured that the composer’s reputation – except for Cavalleria – remained obscured. By a strange coincidence, the year 2001 saw two English language books on Mascagni which have, hopefully, contributed to the current revival of interest in the man and his operas. The first was my own volume in the Greenwood Press, Bio-bibliographies in Music series. Within a year, a magnificent and superbly researched biography by Alan Malloch gave us the most thorough, accurate and revealing portrait of Mascagni to date. Performances of operas other than Cavalleria do occasionally feature in opera house schedules around the world, and it is heartening to see that the Wexford Festival will be presenting the rarely-staged Guglielmo Ratcliff in October 2015. This was the work that impressed even Giuseppe Verdi, so it’s a good choice to mark the 70th annivesary of Pietro Mascagni’s death. For more information, please visit www.mascagni.org. Images courtesy of Roger Flury.